How to scare up more business for Halloween! Urban India has appropriated Halloween for a while now as a calendar festival – one that we have absorbed into its culture with all the associated fun and rituals. Restaurants and pubs have taken a special effort to make this a huge success, and it seems to have worked very well for them. Posters and announcements have already gone up on social media platforms and event listing sites have a dedicated page for Halloween parties. With every year there seem to be more and more restaurants doing something interesting for Halloween and why not? It’s a day that is plump with opportunities. Halloween celebrations in restaurants and pubs seem to have many takers. It’s a fun event for adults to dress up and party. Because why should adults be left behind on Halloween? Who wouldn’t love to play dress up and have some fun? 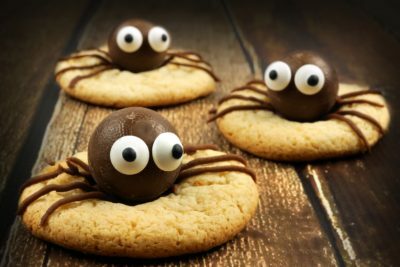 Restaurants that would normally entice their customers with fun and inviting décor are quite happy to explore a scare fest to draw their customers in for this day, the 31st of October. Traditionally, Halloween is celebrated in neighbourhoods or in party halls where parents and children gather for tricks, treats and costume parties. Restaurants have seen the business opportunity in opening their doors to costume-clad Halloween enthusiasts who are quite happy to celebrate this day with food, cocktails and more. Besides, Halloween is no time to be sitting at home and watching a horror movie with a tub of popcorn. There are far better things to do, like go on a Halloween hopping trail of all the restaurants and pubs which have a special promotion on for the festival. 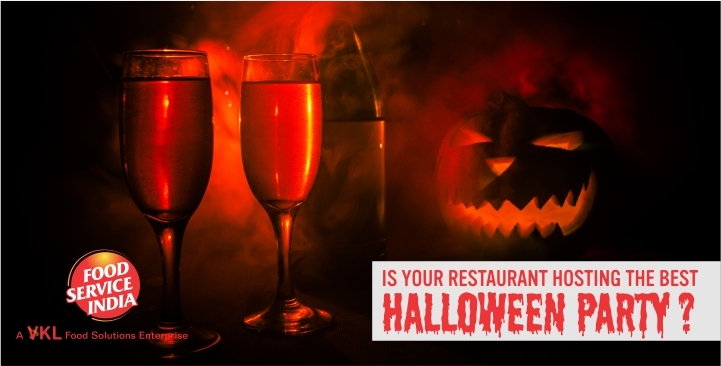 With Diwali and Dussehra done, Halloween fills in a gap by giving restaurants, pubs and customers, something fun to do. It’s a long wait till Thanksgiving and even longer till the countdown to Christmas. So dressing up like zombies and ghosts is a great way to show your creativity with makeup. Also, since not everyone gets invited or hosts a Halloween party at home, partying at a restaurant is the next best option. And you can choose how you wish to celebrate this day. Different restaurants and pubs have focused on different ways to ring in Halloween this year. Each outlet finds innovative ways to lure customers in with their ‘Halloween-special’ food, décor or activities. At Hilton Embassy Golf Links, there’s a Harry Potter-theme party complete with Elixir of Life cocktails, free handouts of glow bands and candies, and a feast like at Hogwarts. Clearly aimed at Potterheads, anyone looking for something fun to do on Halloween night, will consider this seriously. 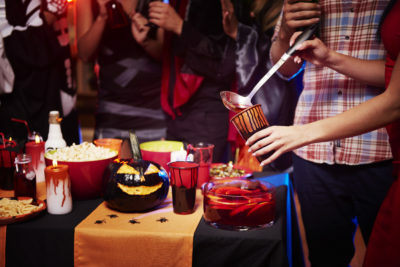 Restaurants can borrow heavily from all the scary theme movies and pop culture references for everything from décor, food, drink and activities. A joke that was going around on social media said, `I’m not going to do any dusting this week because it’s Halloween. ’ So yes, if you’d like to dine in a restaurant with fake cobwebs, drop down paper bats suspended from the ceiling, dim lights, carved out pumpkins and haunting music, you have plenty of options. Just to prove that all you need is imagination to connect anything with Halloween, Phoenix Market city had a Hallo-wine festival, a wine festival showcasing premium wines, a flea market, grape stomping music and stand-up comedy. Not missing out on the Halloween excitement are big brand hotels like Ritz Carlton which had pre-Halloween events at the Bang, the terrace bar. Guests were offered complimentary blood shots, encouraged to dress up in ghoulish costumes and a face painting artist at the venue put the final touches to their spooktacular looks. What’s a Halloween without some spooky activities? If you find pumpkin carving too sedate, Prost has a zombie-theme evening with customers being encouraged to dress like zombies, act like zombies and engage in a Human vs Zombie battle. The allure is, of course, the promise of prizes to be won and free beer. Clubs have found a way to add an Indian touch to Halloween, by have DJs spinning people’s favourite Bollywood tracks. Even Zombies must dance! Making the most of the horror films and spooky movies is Social, which is screening movies like The Conjuring and the Addams Family while putting out special food and drinks for the occasion. All you have to do is dress up and show up. But the most fascinating aspect of Halloween is the variety of food and drinks that can be created for this special occasion. Even if you don’t have a special menu, you could give the dishes spooky names. From Witches Brew to Poison Punch, there’s no limit to the names you can conjure up. If they look especially disgusting with floating eyes (chia seeds or sabja seeds can do the trick or an olive made to look like an eye), it can make the drink all the more appropriate for the occasion. To add theatrics to a drink, a lot of bars are using smoke guns, dry ice or smoking a garnish. Unusual food colours can give regular drinks a creepy cred and how. The world has gone quite crazy over the Freakaccino or the Freakshake and if it freak’s you out, it’s probably what should be on every restaurant’s menu. A Freakaccino as created by Bobby Bournias of the Brownstone Pancake Factory is not just a hazelnut cappuccino. The cup’s rim is coated with a generous slather of Nutella and then rolled in crumbled wafers. Then a chocolate cupcake is pierced into the rim of the cup and hazelnut cappuccino is poured into it. Clouds of whipped cream are topped over the coffee and more Nutella drizzled over it. Finally, it’s ready to be consumed with a sprinkle of castor sugar. See, it’s not for the faint-hearted. Foods with spider web decorations, Oreo cookie bats, gummy worm garnishes and ghost cupcakes are some of the snacks you might find in restaurants. And if it’s served by a zombie, it’s a complete value addition.